"Poor Howard" Stith has been performing 12-string barrelhouse blues for over forty years. As a student of Dave "Snaker" Ray in Minneapolis, he perfected his 12-string guitar style and showed that Delta blues could be found at both ends of the Mississippi. This led a fellow Minneapolis performer to tag him with the moniker “Poor Howard”, after the Leadbelly song. Over the years, Poor Howard has performed across the U.S., Europe and Japan, entertaining audiences in coffeehouses, bars and at festivals with his dazzling guitar, heartfelt voice, and seemingly endless supply of anecdotes, puns and shaggy dog stories. He has shared the stage with such notable blues performers as John Jackson, Archie Edwards and Peg Leg Sam. 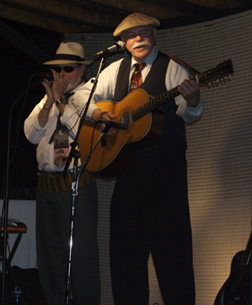 Poor Howard's blues style is drawn from the tradition of Huddie Ledbetter (Leadbelly) and Blind Willy McTell, incorporating a powerful bass line along with flashy finger-picking, His guitar style and poignant vocals can carry the listener into the world of rowdy barrelhouses or into the field at the end of a long day of weeding crops. His passion and reverence for the country blues of the 20’s and 30’s is infectious, and he instills a new interest in this roots music where ever he performs. Howard presents a program that is both entertaining and educational. Recently, Howard has teamed up with harmonica player, Mike "Bullfrog" Rogers, a forty year veteran whose styles range from folk to blues. In the past, Mike has opened for such performers as John Hammond, Luther "Guitar" Johnson and Emmie Lou Harris. Mike also appears with the groups Salt River and Wooden Eye, and has appeared on over thirty CDs.